The Dravidians had their own tradition of writing. It would appear that they introduced writing to the Indus Valley.They continued to use this writing on their pottery in South India and later punch-marked coins. This is supported by the discovery of writing in South India dating back to before 600 BC. 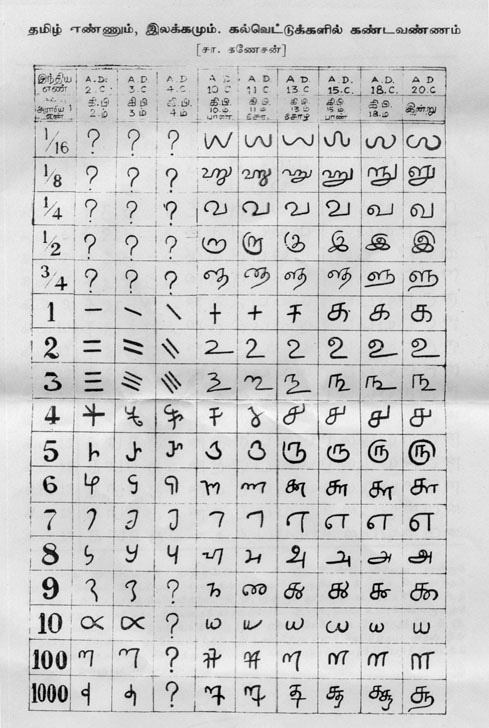 For example, The Russian scholar Yuri Knorozov suggested, based on computer analysis, the Dravidian language as the most likely candidate for the underlying language of the script. Knorozov's suggestion was preceded by the work of Henry Heras, who also suggested several readings of signs based on a proto-Dravidian assumption.The Finnish scholar Asko Parpola wrote that the Indus script and Harappan language "most likely belonged to the Dravidian family".Parpola led a Finnish team in the 1960s-80s that, like Knorozov's Soviet team worked towards investigating the inscriptions using computer analysis. Based on a proto-Dravidian assumption, the teams proposed readings of many signs. A lot of people agreed with the suggested readings of Heras and Knorozov, one such reading was legitimised when the Dravidian word for both 'fish' and 'star', "min" was hinted at through drawings of both the things together on Harappan seals. A comprehensive description of Parpola's work until 1994 is given in his book Deciphering the Indus Script. Iravatham Mahadevan, another historian who supports the Dravidian hypothesis, says, "we may hopefully find that the proto-Dravidian roots of the Harappan language and South Indian Dravidian languages are similar. According to Mahadevan, a stone celt discovered in Mayiladuthurai (Tamil Nadu) has the same markings as that of the symbols of the Indus script. The celt dates to early 2nd millennium BCE, post-dating Harappan decline. Mahadevan considers this as evidence of the same language being used by the neolithic people of south India and the late Harappans. brushed the odorous sandal from her lovely breast ! " Naladiyar belongs to the post Sangam period ,around the same period as Kural. Also,Based on the literature analysis, Kamil Zvelebil believes writing was known to Tamil people at least from the 3rd century BCE. 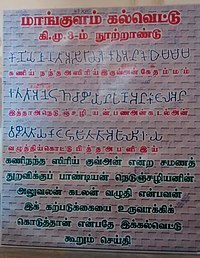 The picture of the urn with the rudimentary Tamil-Brahmi script, and a human skeleton and miniature pots at the Iron Age urn burial site at Adichanallur in Tamil Nadu is attached. here, The inset with the arrow mark depicts how the script has been written inside the urn.It Might date back to 500 B.C. The script found at Adichanallur could be the name of the hero whose skeleton is in the urn. It may be tentatively read as, `Ka ri a ra va [na] ta'.However, The reading is subject to improvement. Gurumurthy found, like Lal before him, that the graffiti on South Indian pottery was engraved with Harappan signs.This further supports the view that continuity existed between Harappan writing and Brahmi–Tamili writing discovered in South India. The recent discovery of a Tamil–Brahmi inscription at Adichanallur is interesting because the site is dated between 1500 and 500 BC by thermo-luminescence .So the script is also likely to be dated to 5th century B.C. even if we take the latest date into consideration.